Sent off the 4-7 favourite, Aidan O'Brien's Irish and Yorkshire Oaks winner Seventh Heaven disposed of the opposition in this Group Two without being flat out. Galapiat was the first to lead but Pinzolo went on after a quarter of a mile until two furlongs out, when Ryan Moore asked Seventh Heaven to go and win the race. She pulled clear in the final furlong and was five lengths ahead of French raider One Foot In Heaven at the line. O'Brien said: "She's a lovely mare. We know she gets a mile and a half well and she loves good ground or better and she's progressing all the time. "Obviously she was a very good mare last year and physically she's doing very well. She ran some very good races last year. "We came here today with one eye on the Coronation Cup. We tried to get a run in between and this race might work for her. 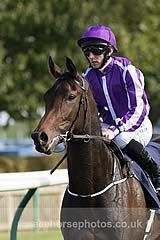 We were delighted with her in Dubai and this race was lovely. "You have to be very happy with her." Moore said: "That was very smooth. Quick ground is very important to her. She hasn't had her conditions since the Yorkshire Oaks and she has done remarkably well from three to four."